College Hockey HH: Head East with the Goal to "Go West, Young Man"
Today is the day. 2:04pm CDT the puck drops for the start of the 2011 NCAA Men’s Ice Hockey Tournament. The first game of the tourney pits UMD and Union, two teams that have played seven times total and not since 2003. We can only look at trends and speculate outcomes. Pace. UMD is a transition speed team and Union also has their share of speed. Limiting odd man rushes, as always, but especially against Union, is needed. The Bulldogs struggled to limit rushes by Bemidji in the Final Five loss to the Beavers. That was not what propelled the Beavers to the win, as UMD skaters and goalie Kenny Reiter stopped the rushes. With the scoring power of Union, don’t expect to be able to hold off scoring chances like that. Don’t expect the same number of rushes against the Bulldogs as Union and Bemidji play vastly different types of games. The Bulldogs should be very ready for the speedy and opportunistic Dutchmen. Special Teams. Union’s power play is well documented at 31.1%. Keeping the game 5 on 5 is imperative for the Bulldogs and their chances. 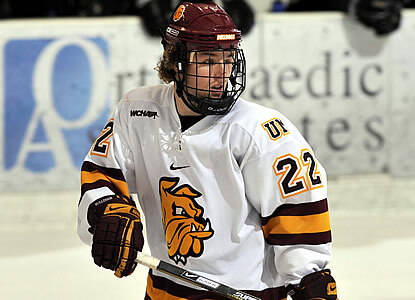 UMD’s power play isn’t bad, but the Bulldogs would rather it stay even strength, let the teams decide the game. Officiating should be interesting as the crew should be from the CCHA or Hockey East, two conferences not represented at the Regional. This is playoff hockey and penalties should be called when needed, not to control the game per a conference’s guidance of how they believe hockey should be played. **Side note: That goes for WCHA officials who seem to err on the side of not calling penalties….at all in the playoffs. Rest. Union was off for two weeks after their early exit from the ECAC playoffs. How will the time to think and practice affect the Dutchmen? It may be interesting to see if they have rust or even nerves after breaking the routine of playing every weekend. No team wants to leave a tournament without hardware, but the early exit from the Final Five may prove beneficial for UMD. They played last weekend, or close enough, and was afforded rest and practice before having to fly east. Team Depth. Union has two strong lines, arguably three. UMD has a top first line, but where does it go from there? The Bulldog second line, Oleksuk line, has produced many goals this season, but fewer as of late. More concerning is the defensive play by the second line coming down the stretch. Coach Sandelin cannot bench the second line, so they have to step up and if nothing else, play some good defense. Scoring some goals would be an added bonus, but defensive responsibility first. Except for the FCC line, the only forwards with a plus for the season are Jake Hendrickson and JT Brown. UMD should not alter their game plan, they should play the hockey that has brought them success this year. But they do have to be aware of their defensive responsibility. Goaltending. Union has the hot goalie, Keith Kinkaid, with his 0.920 save percent and 1.98 GAA. Kenny Reiter (0.911, 2.36) has played well, but has been 3-4-3 in his last ten games. Many NCAA fortunes have been hinged by goalie play. Kenny will have to be on his game for UMD to win to play again. Coaching. We give a tip of the cap to Scott Sandelin who has taken teams to the Final Five, NCAA Regionals and Frozen Four. Sandelin is regarded as a “playoff coach” adept at getting teams ready to make runs into the playoffs. This is a team that Sandelin has a good chance of taking back to Saint Paul and to the championship. As was stated in an earlier post, this is a Regional that UMD can win. It is arguably the best scenario for UMD getting to Saint Paul and the Frozen Four. The season leading up to this shows that UMD belongs and has beaten the best, and also lost to the have-nots. Union too has proved that they also belong and the game today against UMD should be a good match. Ultimately, UMD will use playoff hockey to neutralize Union’s power play and prevail in a high scoring affair to play Yale in tomorrow’s Regional Final.